be careful with that, tried it before with Orcon...was told i definitely have ufb. once we moved in they told us we have ufb but they couldnt provide us with fibre internet, was forced to go with xnet and their crazy data charges. Xnet had monopoly of the area. basically, do your homework....prob the best way is to ask the neighbors. BOF areas (xnet as SP) are now being sold as and migrated to NGA (Chorus GPON) other providers can now resell these services there is no xnet monopoly. Disclaimer: Comments I make are NOT on behalf of my employer, these comments are mine and mine alone. Ahh makes me wish I was in a UFB zone. Hmm might be time for me to finally hop on board the Snap UFB train. Is naked UFB a thing yet with Snap on this plan? 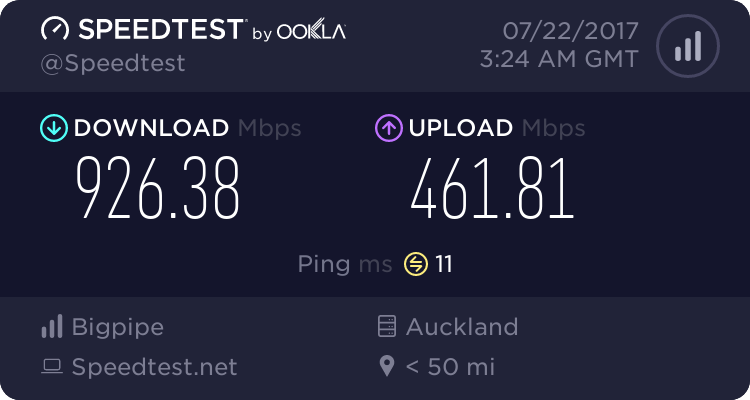 When are you going to be able to offer this increased speed over the Enable Network in Christchurch??? Does this make Maslink the lyrical Jessie James? There's a lot of work being done by "the industry" ie LFCs and RSPs around over-clocking of services, so that the RSP can deliver (if they're good!) the headline speed. You're seeing the results of this now. 200/50 trial service with Enable has been booked for next week. Awesome - how do we get on the trial??? ?